Acrylic T Bar Jewelry Displays, 15.5"
Acrylic Single T-Bar Necklace Displays, 15"
Acrylic Single T-Bar Necklace Displays, 18"
Burlap / Lace, Jewelry T Bar 1-Tier Oval Display, 7.34" x 3" x 5.25"
Burlap / Lace, Jewelry T Bar 2-Tier Oval Display, 7.75" x 4.25" x 7.5"
Dimensions: 6.5" x 6.5" x 8.5"
Dimensions: 11.5" x 13" x 9"
Dimensions: 20" x 8" x 15.5"-27"
Our new line of T-bar jewelry displays are the hottest look to show off your jewelry. 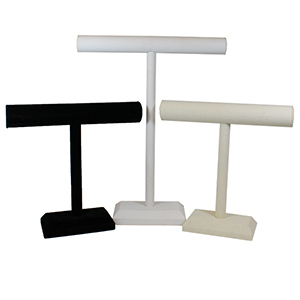 These T-bar are made of leather, linen, velvet, and acrylic. T-bar made of Velvet and linen has a fabric texture with a soft feel. Whereas, T-bar with leather is smooth and skin-like texture. Lastly our acrylic T-bar displays are see-through which prevent the customer from being distracted by the jewelry holder. Each of our T-bar displays also have multiple of colors in white, black, or cream found at American Retail Supply. T-bar jewelry displays come in different sizes to fit any type of jewelry. Tall T-bar displays are perfect for necklaces and chains. While our smaller T-bar displays will be better suited for earrings, rings, and bracelets. Having a variation of how you display your jewelry is based on the shape of the T-bar. American retail supply has T-bar jewelry displays in oval, round, thee tier, two tier, and single tier. Picking different types of T-bar jewelry display will give different perspective to your clients. Shop with American Retail supply who has been supplying Jewelry displays to business for years. Call 800-4260-5708 if you have any questions.